Many people assume that finding the best pedestal fan is a fairly straightforward and simple task. And maybe in the past, when there were only a few brands on the market that often possessed the same features, this was true. These are just some of the considerations before buying a pedestal fan. There’s a great range available these days and different brands offer different features. So what’s the best pedestal fan to keep things cool for you? Read on below as we cover all your options in our comprehensive guide. For the most part, you can get very good pedestal fans for under $100 but if budget is not an issue for you, there are a number of good options for your over $100 if you want to spend a little more. When hitting the hundred mark you start to get more niche fans such as rustic, decorative, retro, bladeless and industrial rather than your standard fans. There are actually a number of decorative options and styles available. These decorative options are a bit more expensive given the extra details that have gone into them but they certainly have a more interesting but unique flavor to them. We run through the best decorative fans later in this article so be sure to read on. Dyson of course always feature in the expensive but good quality section of our fan articles. They have, of course, a bladeless pedestal fan, the AM08, which has a number of high-quality features. If you are looking for extreme wind power then you might consider industrial pedestal fans which we will also cover in more depth below, but generally, you are looking at over $100 for good industrial pedestal fans. Vornado has a number of high-quality air circulator options which have great reviews and we think are worth a mention. For this category our recommendation for the best stand fan is the Vornado 783 DC. Find out more about Vornado DC motors in the below video. This fan misses a few features that some like to have. It doesn’t oscillate and doesn’t have a remote control which might bother some. It does, however, work very, has good airflow, looks stylish and definitely unique. Some had minor quality control issues with their fan, however, Vornado does offer a 5-year warranty which is more than any other company, so they obviously believe in their products. It does have extremely high ratings from its purchasers. The Vornado VFAN Sr. has an interesting, vintage look to it, which usually means you love it or hate it. It uses Vornado’s unique Vortex Action and is constructed of durable metal, unlike most other fans which are composed of plastic. There are 3-speed settings and the height can be adjusted within a range of 42 to 55 inches. While it looks simple, Vornado touts the aerodynamic design as well as its metal construction as features that improve safety and minimize noise levels. However, at 21 pounds, it’s heavier than most fans, which makes it hard to move. Unlike most other fans, this one also has no option to oscillate, meaning that the head is stationary, which limits the airflow to one directed stream. The Vornado 783 is a better than average fan and circulates the air well according to most people who have bought it. If you ignore the marketing and don’t expect a ‘whisper quiet’ fan then you will probably be happy with it. The kicker is that this model ditched the variable speed for 3-speed settings and also does not have a remote control. Vornado’s other model has variable speed which many people prefer than the fixed speeds. When it comes to airflow one person will say it’s not powerful, but the next will say it is. In the end, you have to look at the feedback overall and the feedback on the Vornado 783 pedestal fan is predominantly positive. Many found the fan to not only blow a good amount of air but circulate the air around the room well. The fan does not oscillate but the air circulators by Vornado are not actually meant to. Though it may be useful for a fan to oscillate, the air circulators are not designed that way. One of the big things about this fan, especially compared to other Vornado models is the fact that it only has 3 speeds. While this is not unusual for a pedestal fan in general, others that have previously purchased a Vornado have become accustomed to having the option of variable speed. In our opinion, it really is a no-brainer as to which is preferable so its a bit of a shame Vornado reverted back to fixed speeds for this model. One thing Vornado do have over other companies is they back their products quality. Vornado products generally have a 5 or 10-year warranties, which is far more than any other company. While there might be issues here and there, you will find the quality of Vornado products pretty good and this is backed up by their high ratings on all their fan products. While this fan might not be perfect, it is short than other fans, does not have a remote control, opted out of variable speeds and might be a tad more expensive than a regular fan the quality might be worth paying a bit more for. The DC motor and variable speed along with a 10-year warranty make this fan a very attractive option. Though it is probably not as quiet as advertised on high speeds it does have the variable option so you can tailor to your needs. It is powerful and because it is a DC motor it will save you more on power bills than a regular fan. It may not be perfect but it is well worth considering. The appearance of the Vornado 6803 is slightly different than most pedestal fans in that it is thicker and resembles a hybrid of a typical pedestal fan and a floor fan. It is also shorter than most fans, with an adjustable height range only between 31 and 39 inches. However, it uses Vornado’s Energy Smart circulator, which uses up to 880% less energy than a comparable fan. There are touch-sensitive controls at the base of the fan and also a remote control option for further flexibility. With the precise controls, this fan offers 99 airflow settings, which is a much larger number of settings than other fans. If you take the price tag away for a second people think this is a reasonable fan. It blows ok, has a whole lot of speeds, is quiet for some (not for others) has a remote control and is super easy to clean. The issue is when you put the price tag into the equation, at that price, you would expect the quietest, highest build quality and the most powerful fan out there. Whether that is what you get seems up for debate according to a number of purchasers. The Dyson Am08 is a unique fan with no blades, instead featuring Dyson’s patented technologyAir which moves air through an inner aperture, accelerating and cooling it. With no blades, it is a safe choice for homes with small children and pets and this feature also makes it easy to clean. The timer function can be set to intervals ranging from 15 minutes up to 9 hours and the remote control allows the user to select between 10 airflow settings. There is also an oscillation control setting that allows it to move 180 degrees. However, there are no settings on the base of the fan itself, meaning all functions must be operated with the remote. Its height is 56 inches with is no option to adjust it and with a weight of approximately 14 pounds, it is a very sturdy fan. Dyson also reports that this fan is 15% more energy efficient than their AM03 model. However, with a high selling price, it is one of the most expensive fans on the list and would likely not be an option for those with a limited budget. If however, you are looking for pure aesthetics this is probably the best pedestal fan available. The bottom line on this fan is pretty simple. It’s a no-frills, basic fan without all the frills like timers, remotes, wind settings that you might find on other fans. If all you want is a fan that moves a large amount of air, then this fan is worth considering. If you want that to happen quietly, maybe not the fan for you. Bottom line: It blows a large amount of air, but it is not quiet. Probably the best pedestal fan available you will find in this category. To add to that, Rowenta has come out with a new model of their high performing fan, the Rowenta 5670 which adds another speed, more power while keeping their high-quality and quiet performance. While there are a number of choices in this price bracket the Rowenta just has such an outstanding reputation it is hard to consider another fan in this bracket. If if it is too high in the price bracket, we would suggest looking in the under $50 bracket as there are some solid performing, but cheaper models which we think would be worth considering if you are looking around the $50 mark. • Good features such as remote control and timer. In our opinion, this would be the fan to get. It has overwhelmingly positive feedback which is very rare when it comes to pedestal fans. Usually, there are complaints about noise or about the power output but this fan has very little of those. Most people agree this has great output and for the output is very quiet. It has 4 speeds, which is more than the average fan and also comes with a remote control. The most common gripe was about the remote control and its functionality (or lack there-of). You aren’t able to control oscillation and overall the quality of the remote was not high. That said, this fan seems to cover the 2 main bases when it comes to pedestal fans. It is hard for any product to get such positive feedback for such a long period of time, so the VU5551 is definitely worth considering if you are looking for a high-quality fan. This mid-priced oscillating fan seems to find a good balance between power and noise minimization. It moves air up to 1,695 cubic feet per minute and the noise rating is between 40 and 57 decibels, which would be similar to a running computer. The head of the fan is 16 inches tall, contains 5 oscillating blades, which can move 90 degrees in all directions (up, down, left, right). The body has an adjustable height that ranges between 42 to 54 inches and contains additional controls that allow you to change the settings on the fan itself. It offers four different speeds and can also be operated with the included remote control. The highest speed, which is called the Turbo Boost speed, claims to provide an extra-powerful blast of air. At 19 pounds, the Rowenta has a sturdy frame that minimizes the risk of tipping over and with a built-in handle, it is easy to transport for use in different areas of the home. The wire grill covering the blades can be vulnerable to rusting and it lacks a timer but overall this has one of the best pedestal fan ratings on Amazon, and is one of the best oscillating fans, if not the best. Although it is a relatively new fan we can only mostly speculate on it but given that the fan this is based off is probably the best pedestal fan on the market (in our opinion) its hard not to get a bit excited. This new fan adds another speed which takes the tally up to 5 and has also seems to have added what is more power and silent mode. It is rare that most people can agree that a fan is quiet. • Won’t save previous settings once turned off. This fan has many speed settings with 35 speeds altogether with 9 speeds in ‘silent mode’. This is far more than most pedestal fans, and perhaps only beaten by ‘variable speed’ fans, however, the difference would likely be negligible. It has an LED display which you are able to see which settings you are on. This can sometimes be a burden as the light is quite bright so at night it can bother some people. It has a natural, sleep and auto modes, as well as a timer, so has more settings and options than your average pedestal fan. These settings, coupled with the timer, are great options when it comes to sleeping at night. Set your fan to slowly decrease in wind flow as the night wears on and turn off after a certain amount of time. The point is you have those options where with other fans you may not. It has solid power, whether it is ‘high velocity’ might be debatable, and one would want to be careful of expectations before they purchase, but it certainly has good airflow. As mentioned above, if remote control issues and saved settings are the biggest gripes, then you have likely have stumbled across a good fan which is both quiet and powerful. Honeywells Quietset tower fan is a best seller and a pretty good quality fan. So how does the pedestal fan compare? This fan has some good features, remote control, and works pretty well in regards to power and noise, however, it seems like it is let down a bit by quality control and durability. So the Honeywell Quietset pedestal fans is packed with some pretty good features. It has a remote control, 5 speeds, which is better than the average pedestal fan. It also has some sleep timer settings which gives you good options when it comes to sleeping at night. Assembly is very easy and dissembling for cleaning is relatively painless. It has an LED display which for some people is a little bright and creates issues in the bedroom at night for some people who are trying to sleep. Most people were satisfied with the main functions of the fan, wind speed and noise. The unfortunate thing about this fan is there seemed to be a large number of quality issues. A number of reviewers complaining about broken parts, things breaking or the fan just stopping working after a short amount of time. Usually, if it is just a couple of complaints you can put things down to a defective unit, but there were a few too many for our liking. The Lasko 1885 is a good fan if you are looking for something that is no frills, has good power and a remote control. For a plastic made fan it seems to be constructed well enough and has high ratings from purchasers. Lasko make pretty reasonable quality fans and even though this is plastic construction it does not seem to have the quality issues that a number of other cheap, plastic made fans do. The fan is basic in terms of functionality as it only has the 3 speeds and oscillation, so no wind modes, or other features fans sometimes have. The remote control seems to work ok which is a big deal however it does lack the ability to control the oscillation for the remote. It has good airflow, but like many fans with high airflow, output tends to be a little bit loud. There is an LED display which shows which settings you have and again, like a number of fans might be an issue in a bedroom scenario when you don’t want a bright light lighting up the room. Overall a good quality no frills fan. If you are on a tight budget or don’t want to spend a lot of money on a new pedestal fan, you can pick up a pretty reasonable fan for under $50. Surprisingly there are a few reasonable options (when price, performance, and quality) are all taken into account. Though they might not have the power, style, and features of the more expensive fans there is probably something in this price range that will suit if you don’t mind the no-frills approach. Bear in mind that pedestal fans are generally more powerful than tower fans and are a good choice if you want good airflow. You can check out the pros and cons of pedestal fans and tower fans here. Most of the fans we have listed below have had many purchasers and proven performance and for their price tag make them a reasonable option for the price tag. For this category our recommendation for the best stand fan is the Westpointe FS40-8JCA. • Great feedback testament to good quality. In our opinion, this would be the fan to get at this price range. This fan has a 16-inch head with 3 oscillating blades for full room air circulation. It allows for height and tilt adjustment and at roughly $30 it is incredibly affordable. It is also over 13 pounds, which makes it quite sturdy and it is also very powerful. This fan is quiet, especially when compared to others in this price range. It is easy to assemble, but the fan head does block the controls located on the body, making it more difficult to access them. It does not come with a remote control, so using the base controls is the only way to operate it. It also has no timer and can be awkward to move. Several users have reported that it can wobble as the base sometimes gets loose. A simple but effective fan the Pelonis does the job it is meant to. The materials are solid and it has a nice heavy base to prevent any wobbling which is common among pedestal fans. Often many fans are many from cheap plastics which break easily, so for a fan of this price to have sturdy materials is a bonus. There are no whizz-bang features like different wind modes or a remote control or LED displays and it is very much a no-frills fan. Most people agree the fan is quiet and has good airflow which is the common criticisms so really, for the price, you could certainly do a lot worse. This is a best seller and you can kind of see why. It has a number of features for the price and it has good airflow, looks quite nice pretty much what you want in a pedestal fan. However being a cheap fan the materials are cheaper, and the remote control is fickle and often only works when it’s near the actual base. It is also loud which is often the case when a fan has good airflow. That said, most agree, for the price, this is a pretty good fan. We think, however, if you are hell-bent on getting a Lasko, grab the 18-inch model that we review here also, as it is a far newer model and Lasko have had time to improve on the issues this fan ahs. In the under $50 price bracket, his model by Lasko is a very affordable fan that offers 3 different speeds that can be controlled with a remote control. It also has a timer so for a fan of this price it does have a bunch of features. The Lasko 1843 also oscillates and tilts giving maximum control over airflow direction. It does put out a lot of air, some say even too much at the LOW setting meaning it gives out more than a nice ‘white noise’ which is useful for some when sleeping. Given that it blows a lot of air, it also is loud, so if that would be a problem for you it would be something to consider. It is easy to put together and only weighs about 9 and a half pounds making it easy to move. However, the entire fan is constructed of plastic making it less durable than other models. Also, the grill is very hard to remove, so cleaning the blades will be more difficult. The Costway occasionally falls victim to quality issues like a number of other cheap pedestal fans but for the most part, holds up well. It has ok features, blows ok, noise is ok (depending on your noise tolerance) and probably good if you get a good one. Most important there were few issues reported with the remote control not working. It is however cheaply made, made in China, and suffers occasionally from poor quality and lack of durability due to the cheap materials and low construction costs. That said, more often than not this fan has worked well for the majority of people and for the cost it is a reasonable fan. Its ratings are predominantly positive, so if you are looking for a cheap fan with a remote control, the Costway should be a consideration. First of all before you buy this fan, people who liked it and people who did not, all agree that the instructions were terrible (in broken English and not useful) and it was quite difficult to put together. So you will want to be prepared for a little DIY before you buy. Some of the minor gripes with the fan were the bright LED light which can be an issue at night in the bedroom for some people when they are trying to sleep. A number of people commented that the oscillation is quite fast and does not have any settings to slow it down. Like many other fans it does not save settings after it is turned off, so you need to re-program your settings again when you turn it back on. Unfortunately, this is not uncommon among most fans. I lot of people had great success with the fan and found it had good airflow and looked nice. The remote control seemed to work well (which has been an issue with a number of other pedestal fans) and you can also set oscillation from the remote control, which some fans do not have, and really, should be a compulsory inclusion on a remote control. Overall for the price if you want something cheap with a remote control it wouldn’t be a bad option. A later pedestal fan model by Lasko although it is early days in regards to getting a lot of feedback from users, so far things seem positive. Like the earlier Lasko model, 1843, the fan has a remote control, 3 speeds, and a timer. The remote control issue which plagued the earlier model seems to be fixed and the fan seems to be a bit quieter too. If you had to choose between this model and 1843 we would choose this given it is a later model and Lasko has had time to correct issues in the earlier model. We all want convenience and a remote control is a must-have feature for those who want ease-of-use. However, not all pedestal fans come with remote controls. Most new pedestals being produced today will have them, as in order to compete with their competitors more and more features and being added. But a number of the old, proven performers may not have a remote control. There are some great performers in there and we can’t go past recommending the Rowenta VU551 and its newer model. That said, if you are wanting the ultimate convenience it could be worth looking at the Wasserstein smart stand fan. If you want the ultimate convenience, then you can’t go past the Wasserstein smart which has 4 ways to control it, on the unit, remote control, mobile app and Alexa. Although it may not have the proven quality and performance the Rowenta has, it does provide more convenience via the ability to control everything by app and voice. For those of you that MUST have a remote control, we have collated the 5 best pedestal fans with a remote control below. Those looking for the most power from their pedestal fan, whether for home or work, will want to look at industrial pedestal fans. Like most fans, the industrial fans are far larger and far more powerful in terms of wind output which is whats needed an industrial or commercial environment. Industrial pedestal fans CFM (measurement of airflow) can range up to (and potentially more) 9500 CFM whereas our choice for the best pedestal fan for your home, the Rowenta VU5551 has around 1700 CFM. So you can see there is quite a bit of difference in output. With 9500 CFM this fan moves a lot of air. It is extremely powerful and is made from all metal so higher quality materials than standard house fans. It swivels but does not oscillate and has 3 fan speeds. As you can imagine with a fan that moves so much air, the fan is very loud. Most industrial fans are, however. Not many features, which is pretty normal for an industrial pedestal fan but overall a powerful, high-quality fan. At 20 inches and 4200 CFM it is on the smaller side of the industrial pedestal fan scale. It is made from high-quality materials and blows a lot of air. The fan has 3 speeds and oscillates but like many industrial fans that blow a lot of air, it is loud. Obviously not a fan for the bedroom, but for those scenarios you need to move a lot of air, it’s a high-quality choice. A top quality fan that has 7400 CFM. It blows well comes with 3 speeds and is made in the USA with robust construction. Along with that, it is ETL and OSHA compliant and has been tested in accordance with AMCA standard 230.99. No real complaints from purchasers other than about the noise being a bit loud, which you would expect from a powerful fan like this. Without many reviews it’s a bit hard to give any pros and cons for this fan. We did think it was work mentioning given that it oscillates. Many industrial fans do not. This Lasko fan is a high-quality industrial strength fan moving 8780 CFM. Made from high-quality steel it is much more durable than your average house fan. Like most industrial fans it does not have a lot of features, and unfortunately, this one does not oscillate either. In those warmer months when we are all spending a bit more time outside, an outdoor pedestal fan is a great way to help keep cool. Due to the elements though, outdoor pedestal fans need to be made of far more durable and resilient materials. Because of this, outdoor pedestal fans tend to be a whole lot more expensive than your average pedestal fan. There are also a number of pedestal fans of which you can purchase a misting kit to turn your pedestal fan into a misting fan for extra cooling on extra warm days. Designer Aire has a number of niche styled fans in this model and if you are looking for something a little bit different for your outdoor patio, then these fans are worth a look. While it says indoor/outdoor, many believe because of the noise and output, it is better suited for outdoor or larger areas. This 18″ indoor/outdoor fan by Designer Aire has 3 speeds and has an oscillating option. This particular fan is styled with Vintage copper and has a nice decorative base. Designer Aire actually makes a number of different styles fans for this model, so if this one does not tickle your fancy then be sure to check out the other variations. Obviously, being an outdoor fan it has to be made of some more study materials, and also given that this fan is decorative and a bit niche it does cost a bit more than a standard indoor fan. 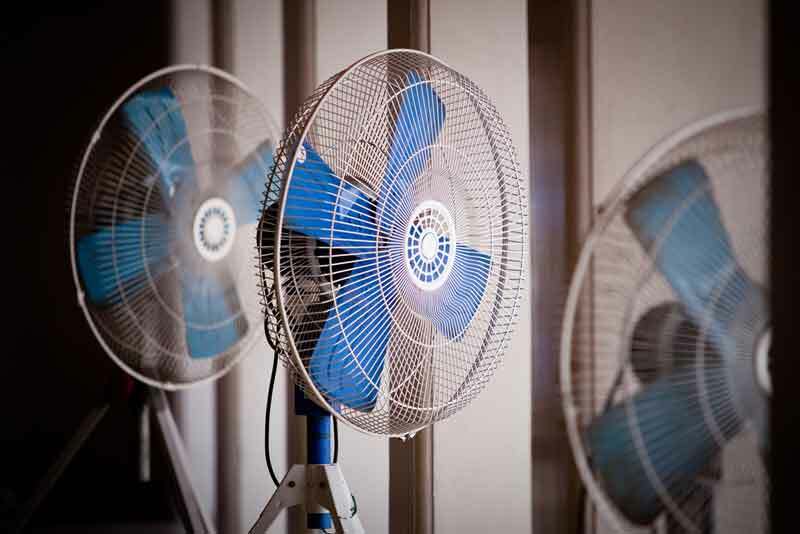 The fan says indoor and outdoors, but many purchasers believe that it is better suited for the outdoors given the amount of air it pushes and also the amount of noise it makes. A number of people do say the fan is noisy, and the noise stems, not from the motor, but from the fan blades and their design. The fan’s design is obviously a bit niche and most were happy with the design and style of the fan and it was also mentioned that the fan is very sturdy which is suitable for the outdoors. Assembly was easy with this fan with not too many people having difficulty putting it together. An important feature with any outdoor fan is that it has a sturdy base so it doesn’t blow around in the wind. This fan is nice and heavy and has a solid base to keep it nice and stable. The fan is made of good quality materials but has been occasionally susceptible to rust at the base or in the screws. Also some people had issues with quality and if one reviewer is to be believed the manufacturer change and quality started to drop a little. We will put that down to hearsay though. The fan has many compliments about its looks and style and would certainly brighten up the outdoor surroundings with its unique design. Like most fans that blow a lot of air, it is quite loud, but given that it is an outdoor fan it would hopefully not be too much of a problem. Overall, as often the case, if you get a good unit it will likely serve you well. This fan from Lasko is one of the cheaper outdoor fans you will find. Ultimately, If you are looking for a cheap outdoor fan this might be worth a look. Like most outdoor fans it blows a good amount of air and is probably not suited for somewhere indoors where you need ‘white noise’. Most say it is quite noisy due to the large amount of air it moves. It is however made of plastic and has a number of comments on its flimsy build and cheap plastic materials. Too often for our liking, people had problems with getting the cover to snap on the fan and found assembly reasonably difficult of that particular part. The fan does oscillate and also has a remote control, although you cannot control the oscillation from the remote control, unfortunately. The fan had minimal features and is best suited as a cheap, basic outdoor solution. If you want an extra layer of cooling for your outdoor patio or space you could consider a misting fan. One pedestal fan that has misting capabilities is the SPT SF-1666M has mostly positive feedback from its purchasers. The fan has 3 speeds of fan speed control and is able to oscillate from side to side in order to spread the mist or airflow around a larger area. It can also be locked in a fixed position for constant misting. As well as being a misting fan, this particular fan doubles up quite nicely as a standard pedestal fan which can be used inside the home. However, should it be used outside as intended it is UV resistant and has a rust-resistant coating. Like most misting fans it connects easily to a garden hose and is stated as being able to cool up to 640 sq ft. The height can be adjusted from between 47 and 56 inches which gives you extra control over the direction of the fan head and where the misting is going to go. Unfortunately not enough feedback to give any indication on its pros and cons, however worth a mention as the little feedback is has got is positive. What the best pedestal fan for your bedroom is could well be very subjective, but let’s assume a few things. Most probably you are going to want a fan that is extremely quiet or delivers a soft ‘white noise’ which can help some people get to sleep. It is also likely that you want a fan with a remote control. There is nothing worse than being in bed and having to get out to go and change the settings on your fan. Preferably too you will want a remote control that doesn’t beep too loudly when you change the settings. You will certainly want a fan that has a number of speed settings. I’m not sure about you but I certainly don’t want to be blasted by gale-force winds when I’m trying to sleep. Having a timer could also be useful so you can set and leave the fan to turn off on its own. There are very few around, but a smart fan would be handy for convenience. Just put all the settings in your phone and you are set. You might also want a night light. Last but not least you want a fan that will be high enough above the bed so it can blow air down on your, or around the room, so a fan with a good range of adjustable height. Below we look at these considerations: Noise, convenience (remote control, smart, light) and height for the best pedestal fan for your bedroom. Everything is going smart these days. There are not many appliances now that you won’t find work with an app on your smartphone, with Alexa or Google Home. Like smart heaters, smart fans have not quite hit the masses en masse yet, there are a couple of options available though if you want to go down that route. Itead have a handy smart fan which can be controlled by app or by voice control on Amazon Alexa. Wasserstein has a smart stand fan which you can control from 4 different areas; on the unit, remote control, app or Amazon Alexa. It has a number of settings with 3 different wind modes and 12 speeds within those wind modes. The fan stands up to 4.6ft tall. Xiaomi also has manufacturer their own smart pedestal fan. So, you’ve decided to go for a pedestal fan but then you run into another obstacle. How do I know which the best pedestal fan is you may ask? Well, worry not because we have put together a detailed pedestal fan buying guide that is going to teach you everything you need to know. Here’s what to look for in a pedestal fan! Fans with adjustable height are much more practical because they give you more options when it comes to usage. Look for models that have both adjustable height and adjustable angle for the best user experience. Even though this is a common feature of fans nowadays, make sure you still check it before making a purchase. This particular feature makes pedestal fans great for indoor cycling. There’s nothing more annoying than a loud fan that distracts you from your daily activities. If you’re going to use the fan in your office or keep it running while you sleep, the noise is going to be a big problem. Always check reviews and see if there are any complaints about the noise before you purchase. This simple feature is a lifesaver when it comes to using fans. With remote control, you can control the fan settings while being away from the fan, which is a great convenience. Just make sure to check the maximum remote control distance is enough for the size of the space you are going to use the fan in. Another handy feature is the fan timer that allows you to set a number of minutes or hours for the fan to be running. Once the time is out, the fan automatically shuts off. This feature is great for when you’re going to sleep but you don’t want the fan to be running the whole night. The more advanced fans have electronic displays with indicators of fan settings. While this isn’t necessary for the fan to be of good quality, it is a fancy and convenient feature to have. It is best to look for fans with several modes instead of just one or two. The modes usually include natural or sleep mode and reduction mode. The natural mode simulates a natural breeze, giving you a comfortable feeling of fresh air coming your way. The reduction mode decreases fan’s speed level every 30 minutes, changing the amount of air being pushed into the room. Having different modes is quite a handy feature, depending on the situation you are using the fan in. Being familiar with a fan’s oscillation level is quite important when purchasing a fan, as the oscillating louvers assist in moving the air around the room. Check the packaging or ask the seller about this information to ensure the fan is powerful enough for your needs. Consider that the fan is going to have to be cleaned every once in a while. To do so, you must take it apart and be able to put it back together after cleaning, because of which you should look for fans with easily removable grills. Don’t let dust build up on the blades of the fan as that may cause it to slow down or malfunction. With a good quality fan, you will get a warranty from one to five years. Fans have plenty of easily breakable parts so you might want to consider the model with the best warranty, just in case of any unwanted malfunctions. Whenever purchasing a fan, consider the size of the room you are going to be using it in. You want the fan to be able to cool your room efficiently so you should look for those with a good CFM rating, which helps you figure out how long it will take for the fan to circulate the air through the whole room. This measures how much air the fan moves per minute and it shows the fan’s cooling capacity. A fan can have a fixed speed or variable speeds, meaning you can either control the speed or have it run the same speed all the time. Fan speed is specified in RPM – rotations per minute – the higher the RPM, the faster the air moves. Variable fan speeds are definitely more convenient as well as energy efficient. Safety is an important aspect when it comes to purchasing any device. With fans, you should look for slip-resistant feet, a grounded cord and whether or not it is ETL listed for safety. The difference between these two motor types is that DC fans have a variable and uneven flow while AC fans change direction times a second to provide consistent flow. DC motors are less noisy and use a lower voltage while AC motors are louder and consume more energy but provide constant air flow. The ultrasonic humidifier fans have a feature that maintains the moisture level in the air which ensures a comfortable and healthy environment. Fans with this feature are quite popular because they make the air fresher and easily breathable. Fans with the misting feature are used indoors on hot summer days to freshen things up a bit. These fans blow a mist of water into the air that absorbs the heat and creates a comfortable environment. These fans are also a great option to cool down in hot weather. As you can see, there are many different types of pedestal fans that offer a variety of options for any budget. In order to select the best pedestal fan for your needs, it is important that you identify and prioritize your needs in order to find the best pedestal fan for you. There are options available for all budgets, and features to suit most circumstances. Best of luck with your search! Have you purchased any of these fans? We would love to get your feedback! 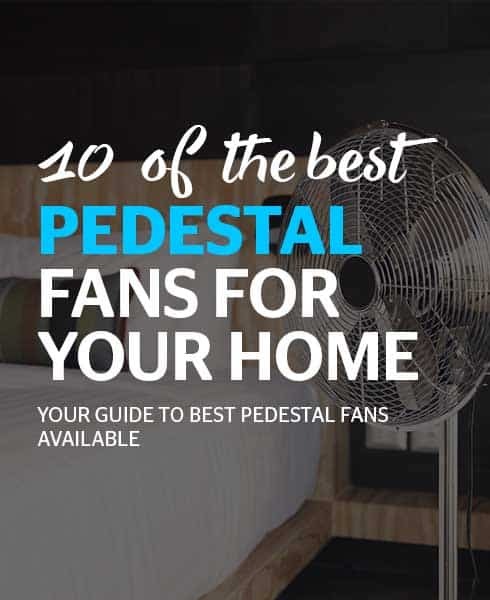 An in-depth buyers guide to help people find the best pedestal fan for their needs covering what to look for and which fans are better suited in which environments.